MANY people would run for the hills if they came across a snake on a beach, but one beachgoer on Fraser Island did the exact opposite. 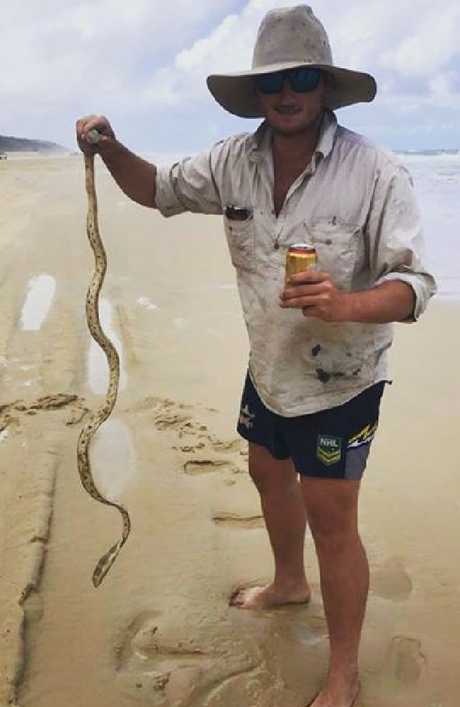 Dalby farmer Jack Hornick was on a fishing holiday last Tuesday when he came across the deadly olive-headed sea snake in a sand embankment and decided to rescue it. His friends used their phones to record the moment he carried the snake by the tail back to the ocean. The footage shows him holding the snake in one hand, and a can of XXXX in the other. Mr Hornick said he had little idea what species it was, but said his intentions were good and he was only trying to save the snake from being hit by nearby cars. "We were driving down the beach there to go fishing and we saw him located up on the sand, so we pulled up, took a photo and threw it back in the water," he said. Gold Coast snake catcher Tony Harrison said the species was extremely venomous. Mr Harrison recommended people who come across sea snake varieties should leave the wrangling to the professionals. "Never try and touch a snake, especially if you're on your grog," he said. "Because you're slower and the alcohol will tamper your treatment." Mr Harrison said it was a lucky thing the snake was relatively lethargic on land. "They are like a slug on valium out of water," he said.